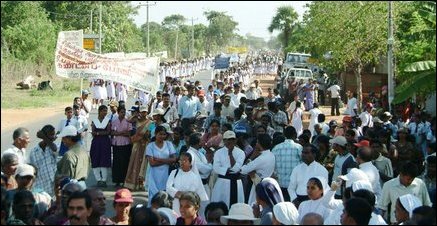 More than 2500 people joined in a protest rally held Monday afternoon 2:00 p.m. in Kilinochchi condemning the brutal killing of Rev.Fr.Nicholaspillai Pakiyaranjith, Mannar Coordinator for the International Humanitarian Organization, Jesuit Refugee Service (JRS), by an alleged Sri Lanka Army Deep Penetration Unit (DPU) on 26 th September, and the killing of number of other humanitarian workers in North and East recently. The rally started from St.Theresa's Church and ended at the office of the United Nations (UN) organization, United Nations High Commission for Refugees (UNHCR) located at Karadypokku Junction. Several Christian and Hindu priests participated in the mile long procession. 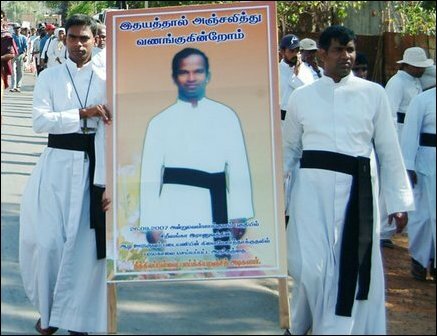 The catholic priests participating in the rally carried life sized photographs of Late Rev.Fr.Pakiyaranjith as well that of Rev.Fr.Jim Brown, who disappeared last year. Others carried life sized photographs of the Tamil Rehabilitation Organization (TRO) volunteers abducted and killed while serving the affected Tamil civilians in Batticaloa and also of the TRO volunteers killed by claymore attack while serving the displaced people in Mannar. The protestors approached the office of UNHCR shouting slogans "Is it wrong to provide food for the hungry people? " Do the religious priests carry arms? "International Community why are you silent? "Are the people in Vanni not human beings? " Near the UNCHR office, a meeting to condemn the attack on Rev.Fr.Packyaranjith was held presided by Rev.Fr.M.T.Sarath Jeevan, Kilinochchi District coordinator of Jesuits priests. Protesters made an appeal to UNCHR to request UN to exert pressure on the Government of Sri Lanka (GOSL). Solomon Cyril, President of the Federation of Jaffna District Public Organizations spoke condemning the killings. 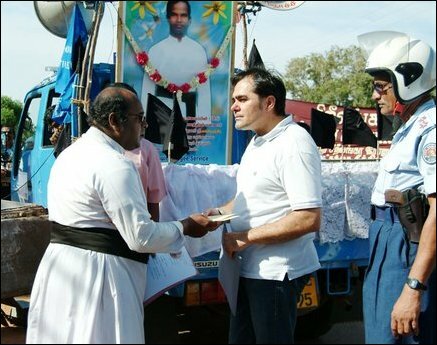 At the end of the protest march, a number of memoranda were handed over on behalf of various organizations including St.Thresea's Church, Federation of Kilinochchi humanitarian Organizations, TRO and Mullaitheevu district Jesuit priests. The memos submitted by the various groups were accepted by the field officer of Kilinochchi UN Office Mr.Marin Din Kadjdomcaj.